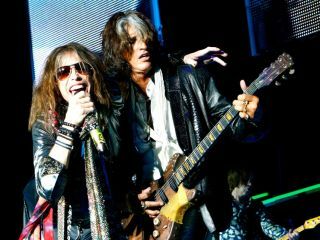 Aerosmith guitarist Joe Perry said today that singer Steven Tyler has quit the band. This comes after a concert by the group in Abu Dhabi. "Steven quit as far as I can tell," Perry told the Las Vegas Sun. Speaking from his home in Boston, Perry said, "I saw online that Steven said that he was going to leave the band. I don't know for how long, indefinitely or whatever." Perry indicated that he and his fellow Aerosmith bandmates usually have "no contact" with Tyler. "He's notorious for that," Perry said. "That's one thing I've learned to live with. I like to pick my battles. Frankly, the last few months I've been wanting not to rock the boat. I don't want him canceling any more gigs. We really wanted to do these last four. "We just kind of didn't want to call him out or anything and get him anymore pissed off, for whatever reason. So we just let things lie. So we did the gigs and, like I said, I got off the plane and saw this online. That's how I know about it." Last week, Classic Rock magazine quoted Steven Tyler all but sealing the group's fate: "Once the band hit the final note and I walk off stage - then I'll tell you the whole story," the singer said minutes before the concert at the Abu Dhabi Grand Prix. "I don't know what I'm doing yet," he continued, "but it's definitely going to be something Steven Tyler: working on the brand of myself - Brand Tyler." For his part, Perry hopes to keep Aerosmith together - with or without Tyler. "Right now I'm adjusting to how we're going to go on," Perry said. "As far as replacing Steve, it's not just about that, it's also four guys that play extremely well together, and I'm not going to see that go to waste. "I really don't know what path it's going to take at this point, but we'll probably find somebody else that will sing in those spots where we need a singer and then we'll be able to move the Aerosmith up a notch, move the vibe up a notch." As far as his personal feelings towards Tyler, Perry said, "I still care for him as a person, or at least the person I used to know. But things change."